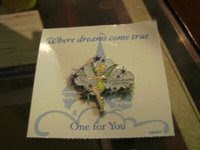 It's a pixie dust pin, it says it'll help to make your dream come true. I am happy to have this since I also have a dream that I really would want for it to come true!! I'm giving this to everyone. You can grab it if you want!